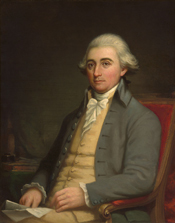 TRUMBULL, Jonathan, Jr., (brother of Joseph Trumbull), a Representative and a Senator from Connecticut; born in Lebanon, Conn., March 26, 1740; graduated from Harvard College in 1759; member, State legislature 1774-1775, 1779-1780, 1788, and served as speaker of the house in 1788; served in the Continental Army as a paymaster; comptroller of the treasury 1778-1779; appointed secretary and aide-de-camp to General George Washington in 1781; elected to the First, Second, and Third Congresses (March 4, 1789-March 3, 1795); did not seek reelection, having become a candidate for Senator; Speaker of the House of Representatives, Second Congress; elected to the United States Senate and served from March 4, 1795, to June 10, 1796, when he resigned; lieutenant governor of Connecticut from 1796 until the death of the Governor in December 1797, when he became the Governor; was reelected for eleven consecutive terms, and served from 1797 until his death in Lebanon, Conn., August 7, 1809; interment in the East Cemetery. Papers: June 8, 1783. Discharge paper. Papers: 1766-1809. 3 feet; ca. 1,500 items. Correspondence, account books, militia returns, and other papers concerning all phases of his life. Also portrait, oil on canvas. Papers: 1763-1903. Ca. 200 items. Chiefly family coarrespondence including photocopies of material in other repositories. Finding aid. Papers: 1 item (1789) in the Ephraim Kirby papers. Papers: Items (1776-1781) in Charles Allen Munn collection of Revolutionary and early Federal Americana, 1684-1877. Papers: 1 item (1790) in the autograph collection. Papers: 1 item (1790) in the Charles Roberts autograph collection. Papers: 1792-1794. Ca. 175 items. Checks and letters. Papers: Personal, business, and congressional papers and correspondence, some copies of material in other repositories (1775-1805) in various collections. Finding aid. Papers: 35 letters (1783-1808) in various collections. Papers: 1 item (1790); 2 letters (1790) in the Thomas Addis Emmet collection; and 2 letters (July 31 and September 6, 1780) in the Elbridge Gerry papers. Papers: 4 items (1782-1809); and 2 letters (August 5, 1776 and October 3, 1776) concerning the Revolutionary War in the Gilder Lehrman collection. Finding aid. Papers: In the Andre de Coppet collection, 1566-1942. Papers: 1787-1811. 54 items. Correspondence and legal and other papers relating to the Ohio Company. Papers: Correspondence and 2 journals (1767-1773) kept as storekeeper in Lebanon, CT in John Trumbull papers, 1750-1883. 10 feet. Finding aid. Ifkovic, John. Connecticut's Nationalist Revolutionary: Jonathan Trumbull, Jr. Hartford: American Revolution Bicentennial Commission of Connecticut, 1977.